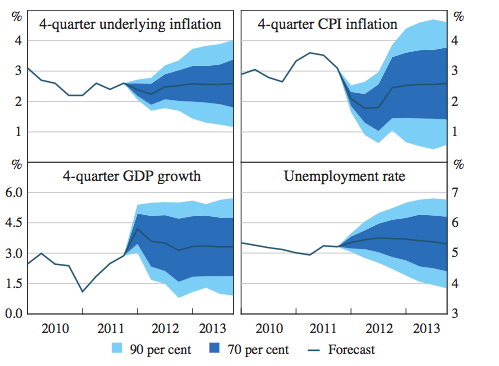 The RBA cannot forecast GDP — and neither can you! The RBA just released a wonderful RDP, which looks at historical forecast accuracy of the RBA’s SMP projections. I love this RDP because it shows how difficult a job forecasting (in the real world) really is. The GDP fan chart says it all — the 90% confidence interval interval on a 3% GDP growth forecast for two years ahead is ~500bps wide. The confidence intervals in Figure 3 strike many observers as wide, particularly for GDP growth. In other words, our estimates of uncertainty are surprisingly high. Initial impressions presumably reflect comparisons with subjective estimates of uncertainty. Psychological studies find that subjective estimates of uncertainty are regularly too low, often by large margins. People have a systematic bias towards overconfidence. So next time you hear two ‘experts’ argue over a 100bps difference in their GDP forecasts, ask them if the forecasts are statistically different. If they claim that they are, they probably aren’t experts (or perhaps they really are both just that much better than everyone else). This entry was posted in AUD, RBA and tagged forecasting. Bookmark the permalink. 12 Responses to The RBA cannot forecast GDP — and neither can you! Great document. The document gets too technical form me, but looking at FIGURE 1, it looks like they have consistently and systematically under-forecasted inflation since 2002 (including the big miss of 2007)…. I reckon this is not only due to the difficulty of forecasting, but it has a lot to due with credit growth and house prices. Lately I am forming more and more the idea that house prices and inflation are very much linked, and a lot more than we think. It’s only lately that house prices have a prominent spot on central banks radar screens. I also think it’s generally politically easier for a central banker to be a “dove” rather than a “hawk”. Google the permanent income hypothesis. This is a coherent theory. Basically, shock house prices upwards and wealth rises. That means higher future consumption. Folks like to smooth C across their lives, so the dip into the equity and eat some of their wealth now. The increase in current demand leads to higher inflation. It is a framework for thinking that i find helpful. It really makes sense… but then why has the RBA consistently under-forecasted inflation in Australia in the last decade, while shares were on the run (before 2008) and house prices too? This would explain why they must now be reluctant to cut rates further since their forecasted inflation has been systematically too low. Of interest was their reference to improved share prices in their last meeting minutes. Those forecast bands suggest fatter-than-normal tails, which I find hard to believe (ie a normal distribution would imply the 90% band was only about 25% wider than the 70% band). Maybe the 70% band should be wider? thank God we have all those clever things that take the things that are going up out! NAB wages and job was lowest since 2009 in their October survey, and at 0.7%q/q (if public service driven) in SA terms, wages are low enough to in target inflation even with lowish productivity growth. gentlemen you need a lot of sectors to have strong wage growth before you think there is a problem. take it from a person who was around in the 80s!! The Australian economy is addicted to inflation… to continuous house price growth and continuous credit growth. Without them the economy struggles. Look at the amount of small business who can’t survive the continuous rise in costs. Problem is the world we live in is now highly deflationary. The high AUD is deflationary. Australia does not have an economy which is adapt to deflation (see Japan or Europe). We were saved by mining. But after the GFC we live in a different world. There’s a limit to the amount of demand you can carry forward by lowering rates. When the mining boom is gone, we shall see what we are left with. I am personally not worried about future inflation at all. I am concerned about past domestic inflation that we have allowed in the last 10 years. That’s all demand that’s now gone. And we will need to revert to mean too.